We have all played all three roles in the bullying “system” – bully, target, and most frequently, bystander. While attention is focused on the bullies and targets, the bystander is often overlooked. That’s unfortunate, because the single most effective tool for stopping a bullying attack is intervention by bystanders. You might think that the bystanders are powerless, but surprisingly, the bystanders have the REAL power. When bystanders intervene, bullying stops in half the time. The most important point to remember is that there are NO innocent bystanders. Bystanders are implicit colluders with bullies, enabling them to continue, whether the collaboration is conscious or unintentional. Bystanders to children’s bullying can be children or adults, usually both. Let’s look at each in turn. Kids’ bystanding can be active or passive. Active bystanders may cheer the bullying on, or organize a ring of spectators with cell phone cameras as paparazzi at a public beating. Active bystanders speak the language of acceptance. “Everyone talks that way,” “She’s a loser,” “Nobody invites her” – these are the words and attitudes of collusion to exclude. 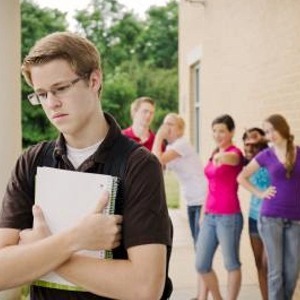 Passive bystanders allow bullying by looking the other way, without intervening or reporting. “We weren’t doing anything.” Sometimes it’s hard to tell – was it actively passive bystanding or passively active bystanding? Let’s not split hairs – let’s just stop it! Bystanders fear retaliation or that they’ll be the next target, in or out of school. This is a legitimate fear in today’s schools and communities. Because of this fear, bystanders try to protect themselves by aligning with the bully and her peers, or at least not misaligning. There is peer pressure, real or perceived, to conform. Middle school is practically defined as a time when no kid wants to stand out. It takes major guts for one kid to stand up and go against a bullying incident already in progress. There is virtually no pressure or expectation for bystanders to act, and there are no consequences when they fail to intervene to protect. Kids have learned that intervening doesn’t help. Bullying has become a long-standing, accepted part of many schools [or teams, camps, or groups of friends]. Even when bullying is brought to adults’ attention, follow through and consistency are poor and bullying swiftly returns, making the intervener vulnerable to “no tattling” code reprisals. Bystanders, especially kids, don’t know how to solve the problem, especially when it`s a problem other than physical bullying. They don’t know how to confront the bully effectively. Bystanders don’t know how to move a group to intervene and are thus unable to tap into the power of the group. Bystanders misjudge the seriousness of the incident. Unless it’s physical bullying, there are no bruises, and the target typically tries to make it look as if it doesn’t really bother him. All the hurt is on the inside. Adults are commonly passive bystanders to kids’ bullying. Adult bystanders can be parents, teachers, school officials, or any adults in a child’s orbit – the lunchroom assistant, the school custodian, or the teacher who witnesses a middle school girls’ “freeze-out.” Since kids often “hide” bullying from adults, many adults who work with kids every day may not be aware that bullying is occurring, sometimes even after witnessing bullying incidents first-hand. Even when faced with a clear instance of bullying, adults tend to make excuses for not intervening, often hiding behind twisted versions of policies and rules meant for a different purpose. “The bully has just as much right to be here (in school) as the target.” Not really. Kids only have a right to be in school when they’re not causing harm to others. Adults usually get involved very late or too late. Sometimes kids don’t tell us anything until they’re at or near the breaking point. As a result, adults tend to be ineffective when they do step in. Adults also tend to over-rely on bullying prevention lesson plans and programs. We have a tendency to react to crises by developing even more programs and enacting more rules and laws. None of these are substitutes for dealing, hands-on, with the real problems that present themselves every day.